The Making of Mollie has been shortlisted in the Specsavers Children’s Book of the Year Seniors. See the shortlist and vote here. Mollie and her best friend Nora are 14 years old. 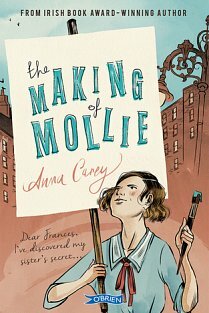 Mollie thinks her life is boring, with her sophisticated older sister, horrible older brother, and “saintly” younger sister, until she finds out that 18-year-old Phyllis is a suffragette. Mollie and Nora set out to find out about the movement, but secretly because this is in Dublin in 1912, when such things are frowned upon by many. The book sets out to teach, in an engaging way, readers about the fight for suffrage in early nineteenth-century Ireland, when the country was already divided on Home Rule. It does this quite successfully, along with historical details about school life and home life for the Irish middle classes. I loved Mollie – she is rebellious but not unruly; she is thoughtful and funny. I liked the (unintentional, from the protagonist’s point of view) humorous asides, the sibling squabbling and the interactions between schoolmates. I liked Maggie, the family’s loyal but wary general-servant, and her feminist sister Jenny. I liked the way Aunt Josephine was weaved into the story, and Mollie’s observations of her. Although the book explained what the suffragette movement was, readers – to get the most out of the book – would need to understand what Home Rule was, and who the main people involved in that were, along with a few other historical references that might go unnoticed or not be understood by a young audience. More, unobtrusive, explanation would have been good. I don’t like the format of the book. It is written as a series of letters – but there are only eight of them in a book about 60,000 words long. The longest letter is over, I estimate, 15,000 words. Letter-writing was undoubtedly more of an art in 1912 than it is now, but for a 14-year-old, a 15,000 word letter is a tad unrealistic – it’s pretty unrealistic for anyone. Overall, it is a story that I think 11–14 year olds will enjoy, although some may find it a little sluggish. The book has clearly been well edited. I would have made a few suggestions. First, I don’t think the letter format works: the letters are nearly all unrealistically long, conversations are quoted verbatim, and some points are shoe-horned in by the ‘as you know’ device. If you are writing a letter, you don’t say “I said crossly”; you would say “I was cross”; there are a few turns of phrase like this that don’t sit well in a letter. I think the book would have worked well as a third person story – in which it would have been acceptable to explain what, for example, Home Rule was, and who Wolf Tone was. It could also work as a first-person account (the protagonist talking to the reader), in which explanations could, with some skill, be part of the narration. If the letter format is kept, I would have suggested more and shorter letters. Also, the recipient of the letters could be a pen pal in England who Mollie has never met – this would give opportunities and excuses for explanations that would help the reader. I think I would have suggested not including the sub-story of the Peter Fitzgerald novel that Mollie’s father was writing. There is a small amount of inconsistency – with style, not the story – e.g. use of capital letters, the way the letters are signed off. There are a few other copy editing and proofreading misses, e.g. the use of the word “loo” once, a missing “un” at the beginning of a word, a wrong apostrophe. The book uses the unusual style of putting full stops after contractions: “Mrs.”, “Mr.”. I’m not sure why as it doesn’t appear to be an O’Brien house style. It could be argued that it is because this is what Mollie would write in her letters, but I’m fairly sure that she would also use double quote marks instead of single, so that doesn’t wash. Probably no one bar me will be irritated by this. Cover: I like the front very much. I like the style of drawing and the muted colours. I’m not sure the back view of Mollie looks like a 1912 schoolgirl – the skirt looks as though it is from a later era and I think she would be wearing black stockings. Admittedly my knowledge of fashion – at any era – is minimal. Internal design: Crisp and neat. Excellent for a school book club. There would be plenty to discuss, from the differences in school and home life to now, and why the suffragettes had to fight for the vote for women. It would have been nice to have a little more about the poorer classes, as children of 14 would have been unlikely to have even been at school – an adult-led discussion could bring this up. There is a little about men with no property not being able to vote, and this could also be used in discussion of class, alongside the conversation between Maggie, Jenny and Mollie about jobs that women of different classes could aspire to. What others are saying: An Amazon UK reader gives it 5 stars (1 reviewer); Amazon US – no reviewers; Goodreads readers give it 4.5 stars (2 ratings). Not many yet. Let me know of links and I will add them. There are a few extracts on the publisher's website. My daughter is 12 and is asking for historical novels but finding some of them hard work so this sounds like one she might like. (She found a book “Lydia” 2 weeks ago and is loving it, written from perspective of Lydia of Pride and Prejudice). I wasn’t educated by the nuns either so can’t answer your query. I’ve not read Lydia. Let me know what your daughter thinks of The Making of Mollie if she reads it. It flows well, so I don't think she'll find it hard going. I think they just call their teachers professors. We used to call teachers that at the university regardless of their title. Anyway, interesting topic! Nice to know a book like that exists.